Daal ke pakode is a winter snack made with tea or coffee in the evenings or for weekend breakfasts in many homes. Weekend breakfast mostly becomes a brunch for us but we normally don't cook elaborated meals on weekends and make something that we enjoy eating in leisure but simpler to cook. So mostly it is something like a platter of hot pakode or crisp cooked methi or alu ke paranthe in this season or a huge bowl of salad in summers. Newspapers and such comforting meals make our weekend mornings very relaxed, usually very late mornings in fact, stretching out well till afternoon. I had soaked urad ki daal (split and skinned black beans) last week to make some kanji vada to be soaked in the kanji that was fermenting on my kitchen counter and a relaxed Saturday brunch of sowa wale daal ke pakode. But on Friday evening one of Arvind's friends called and came to visit us on a short notice for tea. I decided to quickly fry some daal ke pakode and harey lasun ki chutney with chai and as it turned out, this snack became our dinner that day. Not that I am complaining, I did fry some plain vadas and soaked them in the kanji to make the much craved for kanji vadas. Sowa bhaji is a fragrant leafy green that is usually mixed with spinach or methi (fenugreek greens) to make saag or stir fries. We love it in our daals, raw chutneys and even in lehsun sagga. 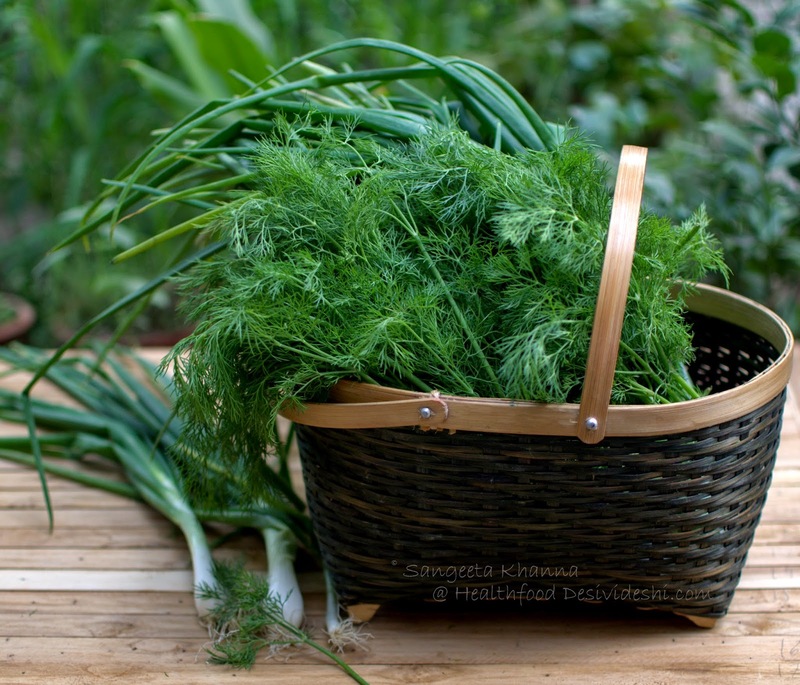 It was after a long time I made pakodas with these dill greens. All of us loved this impromptu meal of pakodas. Discard the soaking water and grind the soaked daal to a smooth paste. Whip some more while still in the mixie jar to make the batter light. Do not add water while making this paste else the batter will get runny and the pakodas would absorb too much oil while frying. Mix this batter with all the other ingredients except the oil and start frying right away. Keeping it for long makes the batter runny and it absorbs more oil while frying. Heat the oil in a deep kadhai and fry small portions of the batter to make pakodas. You can use a rounded dessert spoon or soup spoon to scoop the batter and drop it in hot oil to make pakodas, depending on what size of pakodas you want. Take care to fry them at medium flame so they cook thoroughly, these pakodas do not soak much oil as urad daal is quite sticky and the surface of the pakodas get sealed quickly in the hot oil. 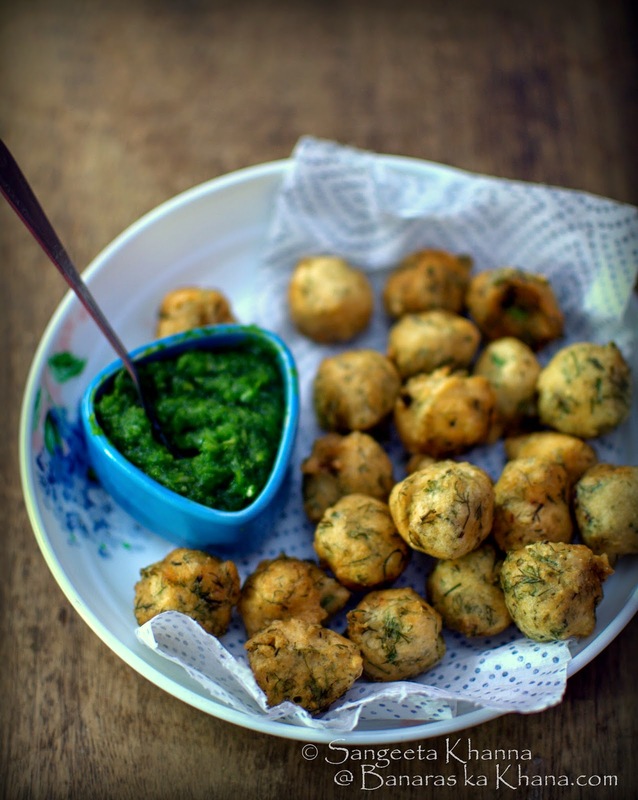 Serve hot with any green chutney but this green garlic chutney works really well with this dill flavoured daal ke pakode. To make this green garlic chutney mix a cup of chopped green garlic (leaves and some of the bulbs) with a cup of chopped green coriander leaves along with 3-4 green chillies, 1 tsp chopped ginger, salt to taste and lime juice to taste. The chutney is so good you would want to make it everyday with all your meals. We eat too much green garlic in this season. 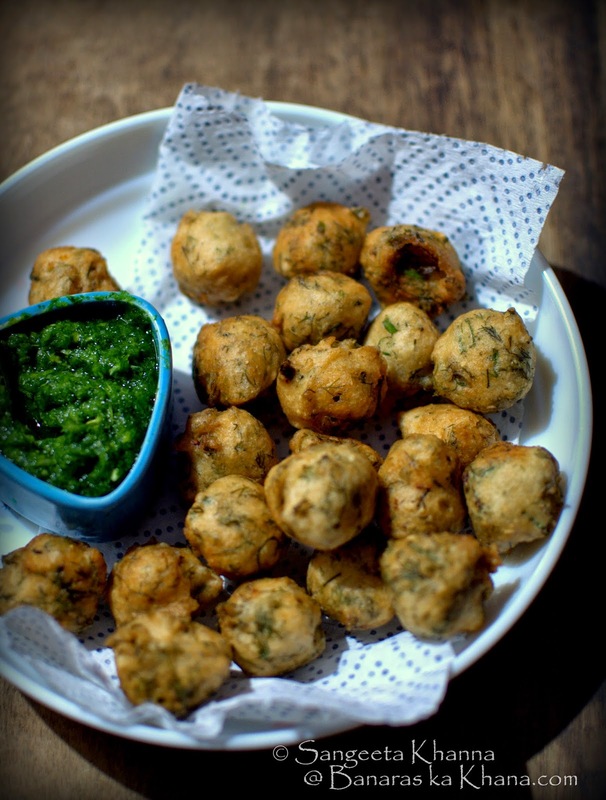 These urad daal ke pakode are irresistible. I suggest you to make it a meal always as such snacks feel guilty if one is heading for a meal after this. Or serve it as starters for an elaborate meal for guests and see how fast they fly. oh my Nupur. Baingan sowa ki subzi with green peas was made recently and I clicked pictures too. Will post very soon. Mouth watery pakodas. I am actually very fond of pakodas but never had with urad daal. Will surely prepare and share the feedback with u. Thank u for the post and the recipe of course.